React Series Part 1: Why Use React, What Is It? This blog post gets you to grips with the features, nuances, and benefits of using the React library. The above example depicts a component at its basic level. The first line imports the React class from the React library. On the third line, a class is created as an extension of a React component. Line 5 is where you will initiate a constructor. The constructor is a special method for creating and initalising objects that the class creates. If you instantiate a constructor, you need to make sure to pass super(), or the props, more on props coming up, returned will be undefined, and will present you with bugs. The constructor is the place in which you initialise state and to bind the methods of the component to this. If there is not state or any methods that you wish to bind; then you won’t be needing a constructor at all. Make sure to always bind methods to this in your constructor, or they will be undefined when they are called. This is a common React ‘gotcha’, and is worth noting. What are props? The props are the properties of a component, its options. Components are very similar to arbitrary functions, and props can be seen as that components input. A component must never change its own props. They are immutable. This is the job of a components’ state, which will be discussed in the next section. This a strict rule that you must remember when developing your applications, as it will produce side-effects if not followed. Whilst this is true, components are also responsible for determining their child components’ props. As you can see, The developer tools also make it easy to find your components in the virtual DOM. What is state? The state of a component defines how a component renders, and how it behaves before, during, and after user interaction. State is the piece of the React pie that allows your components to become dynamic, and also lets you anticipate how to ‘React’ to a user’s input. A state has a default value, for each key value pair, before a component mounts. These values can change over time, and this is mostly due to user interaction. The state object is a representation of a component in a place in time. A component has no business in meddling with child components’ state, unlike props. So, what’s the difference between props and state? The main responsibility of a component is to render data into HTML. With that in consideration, the props and the state together represent the raw data that the HTML output derives from. The props and state is essentially the input data for the render() function of a Component. So now that we have a rough idea of what React is, why should anyone use it? There are countless reasons to use this library. One of the best features of React is how quickly you can get your application up and running, once you’ve configured your workflow and build tools. Because React uses JSX, it lets your brain relax from the mental stress of context switching, which is necessary in typical application development with other libraries. React is abstract. Because of this abstraction, it lets you think of your application in smaller chunks, and how those chunks behave. This also gives your brain a rest; as you’re not thinking about the whole pie; only a slice. 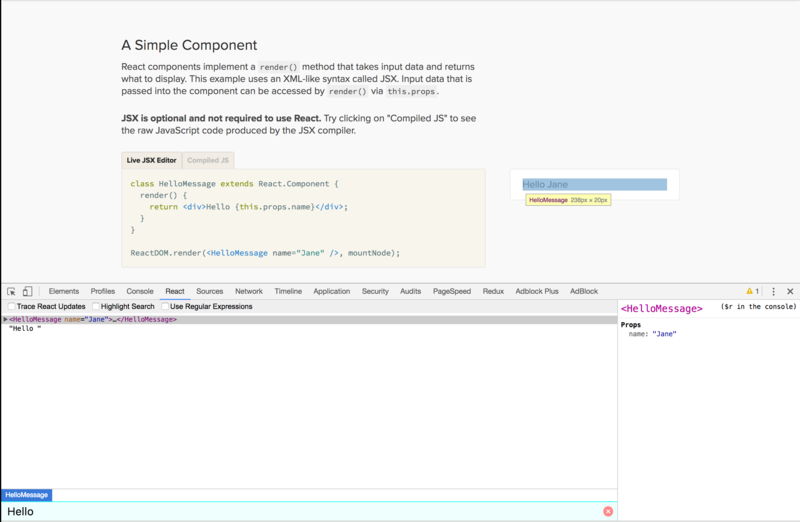 React has its own Developer tools. 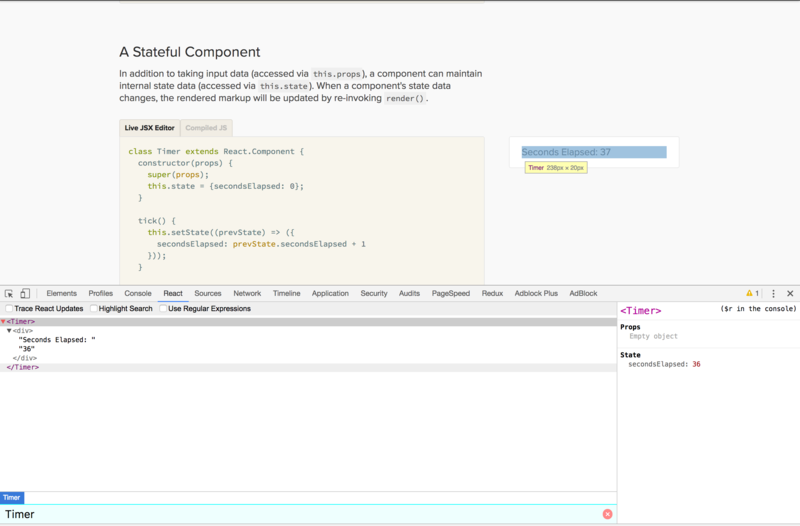 As illustrated earlier in this post; it allows you to follow the state of your components, inspect its props, and debug issues whilst you’re developing React applications. The virtual DOM stops you having to worry about the way in which your components are presented in the DOM, and gives you the extra mental space necessary to juggle the data, improving developer’s productivity, and reducing the mental fatigue necessary when context switching.